In a Greek home, I once was served a delicious tuna salad, and here is my attempt to recreate it. It’s probably not, I believe, arch-typical Greek, but it consists of ingredients that are found in most Greek kitchens. So it’s ok to give you the recipe here, I think. The salad can be served as a meze; you can eat it in a sandwich, or tear up a few different types of green salad leaves and add tuna salad in splotches on top. Seriously good! 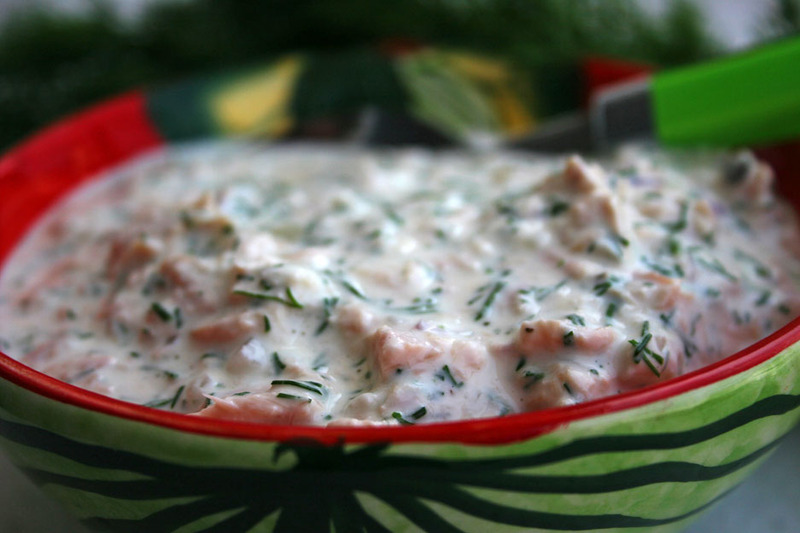 Mix yogurt, mayonnaise, red onion and dill. Pour the brine from the tuna and stir the tuna vigorously in the sauce until it flakes into small pieces. Season to taste with salt and pepper. The Greeks are experts at making really tasty food, using just a few ingredients. This salad is a great example of this capability. If the produce is perfect, let it shine! 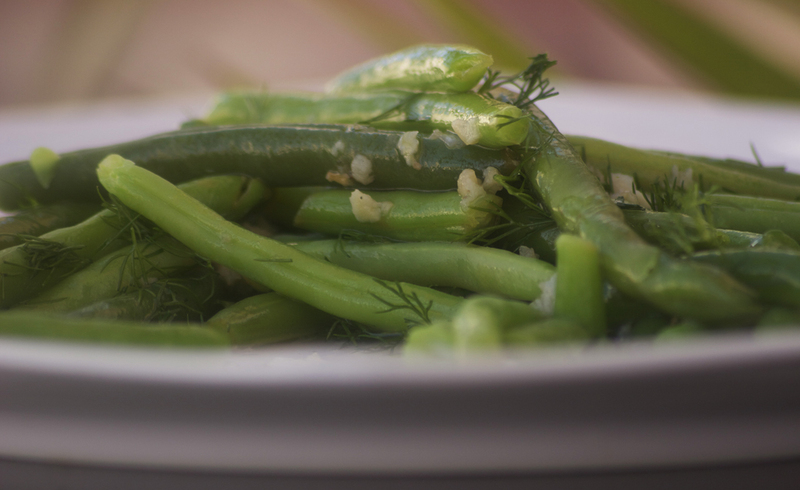 Green beans are used extensively in Greece, and this salad can be eaten hot or cold. The cold variant tastes delicious on hot summer days. I prefer fresh green beans, but frozen green beans often taste surprisingly good too. Garlic can be omitted if you will; it’s actually more common to eat green beans without garlic. Whatever you do, it is almost incredible that so few ingredients can create such a good salad! Heat the oil, add the garlic and let it get a tiny amount of colour. Add salt and lemon to the oil and pour over the beans. Mix well with dill. No, I’m not geographically confused. Russian salad is on the menu of many Greek tavernas and sold in Greek supermarkeds, so it has to be here too. The salad is served as a meze, or as a side dish with fried / grilled sausages or fish. The ingredients tell us that it’s not at all impossible that the salad has roots in Russia or thereabouts, but in France it’s supposedly called “macédoine” – and Macedonia is an area in the north of Greece. Alexander the Great was from Macedonia, but he never ate Russian salad. He didn’t even know potatoes existed. Boil the potatoes, carrots and peas separately, and cool them. 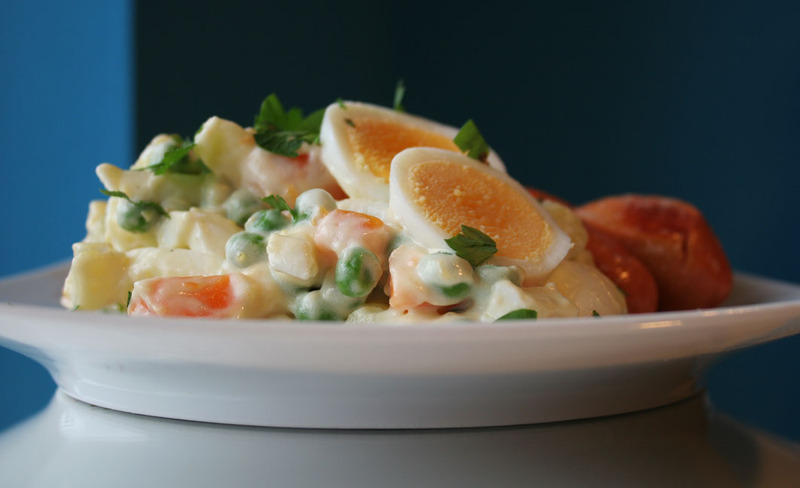 Cut the potatoes and carrots in cubes and mix them with peas and pickled cucumber / capers. Then mix in mayonnaise with salt and pepper. Chop two of the eggs and fold them in, garnish with the last egg. Sprinkle with chopped parsley. As a variation you can substitute the potatoes with “gigantes”, large white beans/butter beans. Boil them yourself or buy canned. This way, the salad tastes more Greek, somehow. 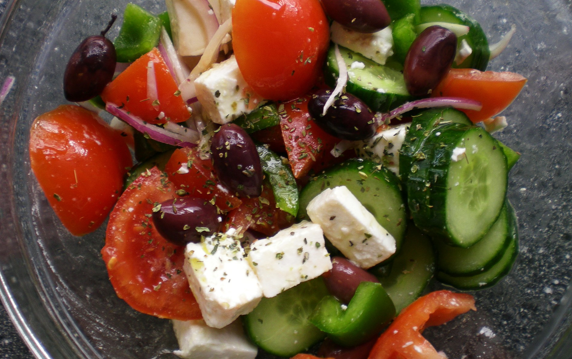 Greek salad is somehow difficult to make if you can’t find perfect vegetables. The Greek tomatoes are sweet and simply taste heavenly, cucumber tastes intensely of cucumber, and the onion is quite mild. It is therefore important to buy the best tomatoes etc. you can find, and of course also buy Greek feta, not an imitation. Cut the tomatoes in rough chunks, red onion in thin rings, green pepper in strips and cucumber in slices. Add olives. You can either cut the Feta in cubes or add a whole slice at the top. Mix the salad with salt, pepper, oregano and a good splash olive oil.